In addition to the grid portion of the template, the Gantt timeline view also provides an illustrated version of your task list, with Gantt bars that show the duration of your project’s tasks across a timeline. For each task, the associated Gantt bar begins at the start date and ends at the finish date. Gantt bars are displayed using the start and finish dates for the tasks in your project. 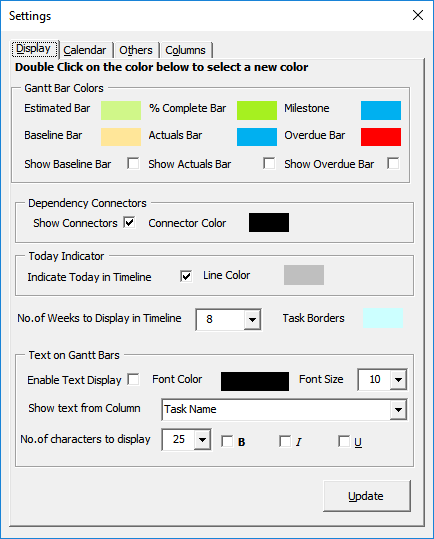 Task completion percentage is added as an overlay over the Gantt bars. This visually communicates the progress of the tasks. The timeline can be viewed in six different views: Daily, Weekly, Monthly, Quarterly, Half-yearly and Yearly view. This feature is particularly useful for lengthy projects. You can also set the number of weeks that you would like to display in the timeline by clicking on the Settings button on the Gantt tab> Select Display tab and then set the “No of weeks to display in the Timeline” option.